Stiga SHT 48 AE 48 Volt Lithium-Ion Hedge Trimmer. Battery & Charger Sold Separetely. 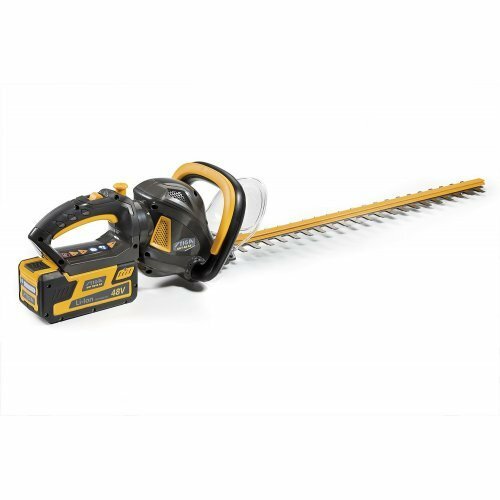 With 61cm dual action laser-cut blades that can slice through foliage up to 20mm in diameter, this hedge trimmer makes easy work of tough trimming jobs. For the optimum cutting angle and a comfortable grip, simply press a button and rotate the battery pack. Not only is the hedge trimmer much quieter, cleaner and easier to use than a petrol-powered model, it's also around half the weight. With a cutting time of up to 25 minutes using the recommended 2.5Ah battery, you will be able to tackle even the biggest trimming jobs. The STIGA SHT 48 AE hedge trimmer, is part of the STIGA 48V Powerpack range. One powerful 48V battery, multiple garden tools.